April 16, 2019, Republica, KATHMANDU: Many parents and students attended an award ceremony marking the global achievement of Nepali AS and A Level students for April 2019 organized by the British Council Nepal and Cambridge Assessment International Education. 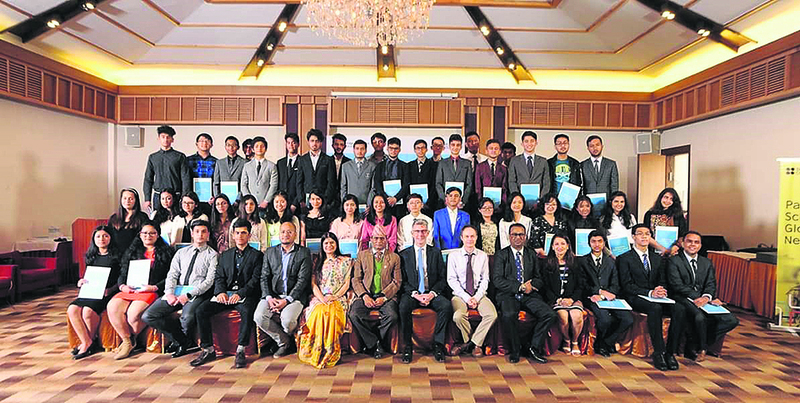 Fifty-three Nepali students from 15 educational institutions were awarded the Outstanding Cambridge Learner Award amid an award ceremony held in Lalitpur on Friday. The awards were presented in four categories. Sakrit Karmacharya for Cambridge International A Level in Computer Science from Malpi Institute, Prajita Budathoki for AS Level in General Paper from ‘GEMS’ Institute of Higher Education and Ritik Yadav for AS Level in Computer Science from Xavier’s International College were awarded for ‘Top in the World’ category. Thirty-seven students were given the ‘Top in Nepal’ award, three were given ‘Best Across awards’ for June and November examination series and 12 students were awarded for ‘High Achievement’ for June and November examination series. Moreover, British Ambassador to Nepal, Richard Morris stated that such advanced programs help students to thrive at global platforms and that the celebrated success is a tribute to parents and enthusiastic teachers. “We encourage our students to delve into the subjects that they enjoy and take the opportunity to study them in-depth,” said Ruchira Ghosh, Regional Director for South Asia, Cambridge Assessment International Education. “Three students have received awards under the ‘Top in the World’ category. This is a remarkable achievement that puts Nepal on a global map,” she added. Furthermore, the ‘Top in the World’ awardees shared their experience on how the environment at school and unrelenting support of their parents took them through this achievement. “My family at home and school lent their full support to help me earn this prestigious award. When it comes to achieving a remarkable result, I think smart work is equally important as the amount of labor you put into studying,” said Karmacharya. The awardees think the award marks the beginning of their intellectual journey to meet their goals and aspirations. One of the ‘Top in the World’ awardees, Ritik Yadav expressed his plans to pursue further studies in computer science or genetic engineering. “To me, the result came as a surprise as I had not expected it. It is crucial for students to study with a relaxed mind and without pressurizing themselves. The important thing is to give your best at whatever you attempt to do,” said Yadav.